It's easy to make small flowers, often called “wild roses,” out of frosting. You can use any buttercream recipe to make these flowers, or a medium-consistency royal icing recipe will also work. Buttercream icing will harden in the refrigerator or freezer but become soft again at room temperature, while royal icing will harden completely and can be stored at room temperature indefinitely. It's not hard to take the extra step and make royal icing. Note that this tutorial uses a small rose tip to create the flowers, but you can easily use a larger tip and produce larger flowers. Fit the piping bag with the rose tip and fill it with your frosting. Hold the piping bag in your dominant hand and the rose nail in the other. Pipe a small amount of frosting onto the top of the rose nail, and press a small square of wax paper onto the frosting, using the frosting to secure the paper to the nail. Position the tip onto the top of the nail, with the wide end touching the nail. The tip should be at about a 30-45 degree angle from the base. The key to using the flower nail is to synchronize your hand movements. You need to squeeze the frosting out of the bag at a steady rate and move the piping bag while also slightly turning the nail. Apply gentle pressure on the bag and squeeze out a small arc of frosting, moving the bag in a circular motion to create a “petal” shape that is broader on the outside and narrows to a point in the middle. While you are squeezing and moving the bag, twist the rose nail slightly in the opposite direction so that when you finish making one petal, your pastry bag is in the same position as when you started. In the illustration, the inner arrow shows the direction of the pastry bag movement, while the outer arrow shows the direction of the rose nail. Note that these are fairly small, subtle movements. Repeat the petal procedure and create a second petal right next to the first. Try to make the petals approximately the same size, and have them all narrow to the same point in the center of the flower nail. You can experiment with the angle of the tip to create slightly different shapes on the outer edges of the petals. Continue making petals until you have come fully around the circle and have finished your flower. For a symmetrical look, aim six petals on the flowers. Don't worry if you misjudge the space and make five or seven. The exact number of petals doesn’t matter. What matters more is that they are close to the same size and evenly spaced. Once your flower is finished, it needs a dot in the center. 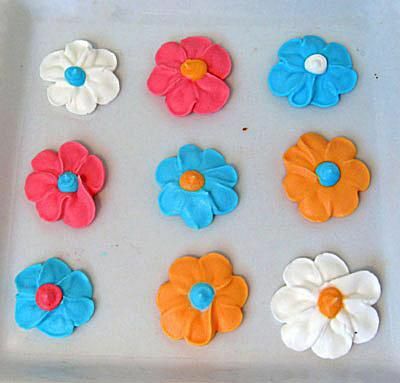 You can use the same color frosting, but it looks better if the center is a different color to contrast with the petals. Fit a piping bag with a small circular tip and fill it with your frosting of choice. Pipe a small, round dot in the center. If you have made larger flowers, you can choose to pipe several dots in a design in the center if you wish. Once your flower is complete, carefully slide the wax paper off of the nail and place it on a baking sheet or another flat surface. Repeat the procedure to create as many flowers as you need (and a few extra in case of emergencies!). If you are using buttercream, place the flowers in the refrigerator or freezer to harden if you are not using them right away. Once hard, they can easily be removed by hand or spatula and placed on a cake. 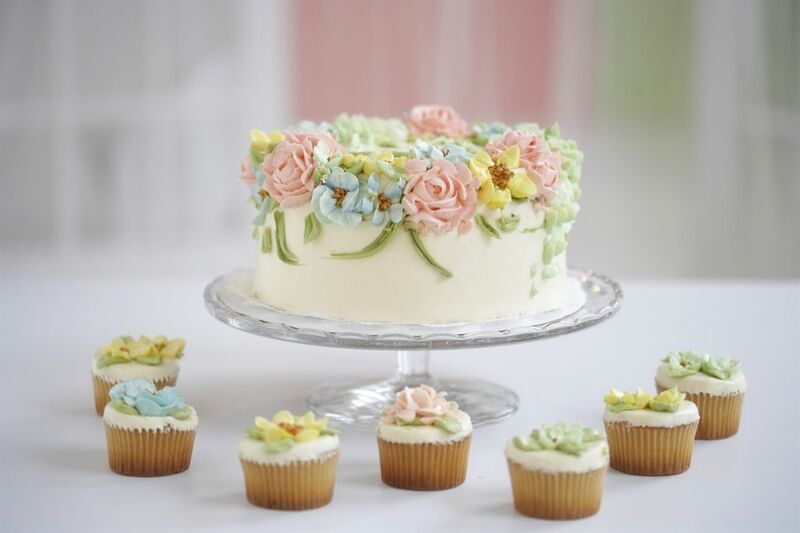 If you are using royal icing, leave the flowers at room temperature to harden. The outside will harden almost immediately, but the bottom (the part touching the wax paper) will take longer, so give them 24 hours to fully set before removing them from the paper. They can be stored indefinitely at room temperature.